He is ranked consistently one of the world's wealthiest people and the wealthiest overall as of 2009. During his career at Microsoft, Gates held the positions of CEO and chief software architect, and remains the largest individual shareholder with more than 8 percent of the common stock. He has also authored or co-authored several books. 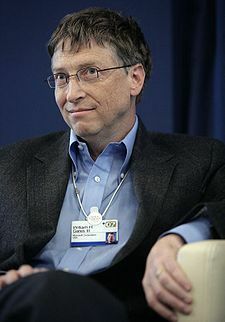 On June 27, 2008, Bill Gates retired from day-to day activities in the company, following a two year transition period from his role as Chief Software Architect, which was taken by Ray Ozzie, but remained the company's chairman, head of the Board of Directors and would act as an adviser on key projects. Windows Vista, released in January 2007, was Microsoft's latest operating system and had sold 300 million copies by December 2008. Microsoft Office 2007, released at the same time, features a "Ribbon" user interface which is a significant departure from its predecessors. Relatively strong sales of both titles helped to produce a record profit in 2007.